Originally run by Johann Wiebelhaus, the leadership passed to his son Franz in 1928. Franz Wiebelhaus led the company from 1928 until 1945 when he died during an aerial attack. Leadership then passed to Franz’s oldest son, who was also named Franz. He led the business until his death in 1985. Shortly after that the company was completely closed down. The original location was in a leased building in Meschede. The location was chosen so the company could take advantage of the available electrical energy and industrial (natural) gas. In 1945 the facilities were completely destroyed by bombs but operations were restored in 1947. The company continued in that location until 1986 when the business was completely closed down. Judging from the English wording used on various labels, some of the axes and hatchets manufactured by Joh. Wiebelhaus & Co. were made for export. Wiebelhaus, Wolfgang: son of Franz Wiebelhaus, grandson of Johann Wiebelhaus. Personal correspondence. Jagel, Richard; Personal correspondence, translation assistance. Label Books; from the archives of the Mann edge Tool Co. Representation of an early company trademark that appeared on a trade card dated 1924. The translation of Eisen-Baum is "Iron Tree" and Fabrikenzeichen means "Factory Mark." Representation of a stamping used on some axes. 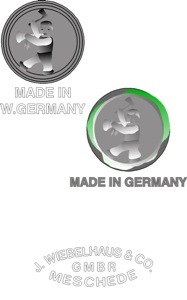 GMBH is an abbreviation for a corporate structure similar to a LLC in the US or LTD. in Canada and British countries. Facsimile of a paper label as included in one of the Mann Edge Tool Co. label catalogs. Vestiges of green paint within and around the upper marking suggest that some heads may have been painted green. A stamping like this was applied beneath the round paper label on the same hatchets. Trademarks in effect in the 1950s and later.